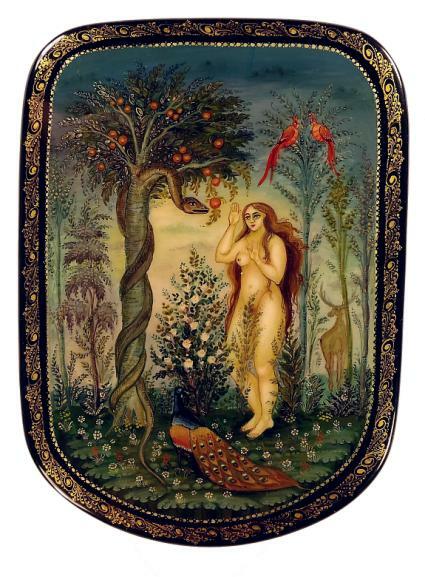 In the Garden of Eden, Eve can choose to eat from any tree, except the Tree of Knowledge of Good and Evil. 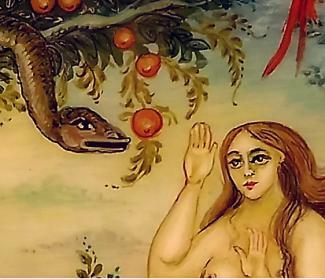 But under the encouragement of the serpent, Eve decides to pick an apple from this tree. A colorful peacock stands at her feet, and a couple small reddish birds are perched in a tree above her head. The drawing has extraordinary details throughout with a lot of very fine gold and silver lines. (The fine lines ae not very visible in the pictures here due to photographic limitations). 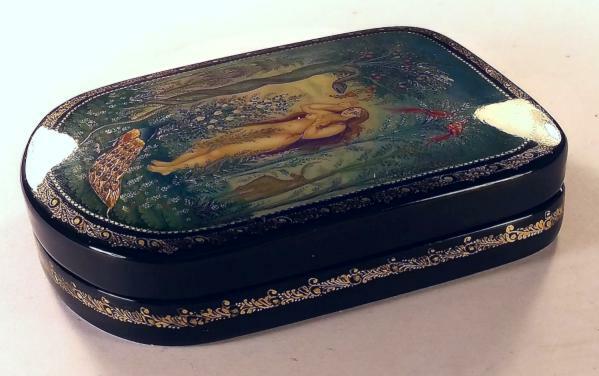 The box has some skillfully drawn borders around the top and the sides. It is made out of papier mache and has a hinge at the top. The interior is red. Signed by the name of the artist, village and title.